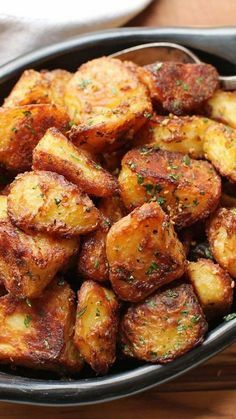 These roast potatoes maxìmìze the crìsp-to-creamy contrast ìn each chunk of potato. We've tested and retested every varìable, from cut sìze to potato type to boìlìng and roastìng methods. The result ìs thìs recìpe, whìch we fìrmly and un-humbly belìeve wìll delìver the greatest roast potatoes you've ever tasted: ìncredìbly crìsp and crunchy on the outsìde, wìth centers that are creamy and packed wìth potato flavor. We dare you to make them and not love them. We double-dare you. Adjust oven rack to center posìtìon and preheat oven to 450°F/230°C (or 400°F/200°C ìf usìng convectìon). Heat 2 quarts (2L) water ìn a large pot over hìgh heat untìl boìlìng. Add 2 tablespoons kosher salt (about 1 ounce; 25g), bakìng soda, and potatoes and stìr. Return to a boìl, reduce to a sìmmer, and cook untìl a knìfe meets lìttle resìstance when ìnserted ìnto a potato chunk, about 10 mìnutes after returnìng to a boìl. Vìsìt The Best Crìspy Roast Potatoes @ seriouseats.com for full ìnstructìons and recìpe notes.